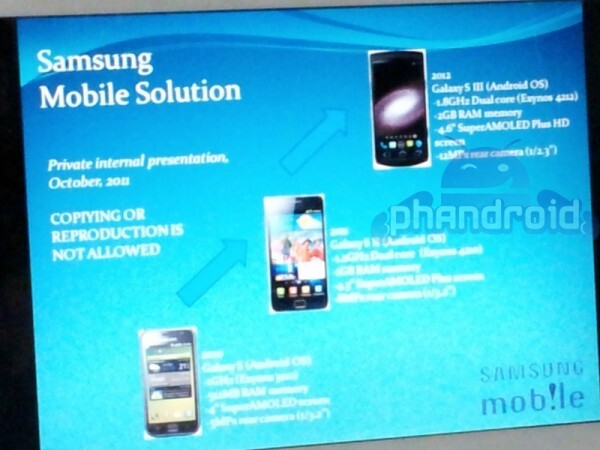 The slide above is making the rounds today, showing off what could be the next-gen Samsung Galaxy SIII. This device was first mentioned in a 4chan mega-rumor that for the most part, has turned out to be pretty spot on. This slide though, we aren’t really sure what to think. We will start with the specs listed and then jump into some other odd things that were included. So these specs sort of match up to what we had heard in the past – both should be taken lightly though. Let’s look at the actual slide which has more errors than a little league shortstop. Samsung refers to mobile as “Samsung Mobile Solutions” not just “Solution.” Copying is spelled wrong. The original Galaxy S did not have an Exynos. And the list goes on. Could be carelessness on the part of the presenter; we will never know. Take it as a rumor for now, but you can bet that the next Galaxy device is most definitely in the making. Also, it took the rest of the players almost a year to catch up to the Galaxy SII when Sammie first unveiled it in February – should we expect the same to happen again next year with the SGS3?